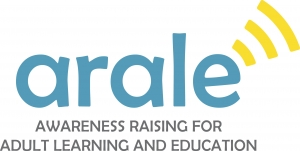 The ARALE Project aims to collect awareness raising and advocacy activities for adult education in Europe directed at the general public, at specific target groups and at policy-makers. How to raise awareness on adult education? Learn more about best practise examples on how to raise awareness on adult education by chosing the target group you’re interesting in and clicking on our examples. Organisations from all around Europe contributed to our survey to find best practise examples on awareness raising activities on adult education. Whether you plan to convince policy-makers, to target the general public or specific target groups, click on the links below to see concrete examples and find inspiration for your own future awareness raising activity on adult education. This project has been funded with the support of the European Commission, Grundtvig Accompanying Measures. This publication reflects the views only of the author, and the Commission cannot be held responsible for any use which may be made of the information contained therein. General public – The ARALE survey analysed awareness raising activities targeting the general public. Specific target group – The ARALE survey analysed awareness raising activities targeting specific target groups. Policy-makers – The ARALE survey analysed awareness raising activities targeting policy-makers. The ARALE survey analysed awareness raising activities targeting the general public. Croatia Agency for Vocational Education and Training and Adult Education Lifelong Learning Week in Croatia The Agency organises and carries out the annual Lifelong Learning Week in Croatia. It promotes adult education by addressing the citizens directly. In 2013, the Agency organised the Lifelong Learning Week opening ceremony, International Literacy Day and Lifelong Learning Fair and co-organised two conferences. Denmark DFS/DAEA Learning Saturday “Learning Saturday” is a one-day version of the Adult Learners´ Week. Its objectives are to make the broad spectrum of learning possibilities for adults known to a wider audience and to form local partnerships between adult education providers. Ireland AONTAS : the National Adult Learning Organisation Adult Learner´s Festival The Adult Learners’ Festival is a nationwide celebration of adult learning coordinated by AONTAS. Events are taking place nationwide, including anything from information sessions, taster workshops, sample lectures to small gatherings of people who love to learn. Norway Norwegian Association for Adult Learning (NAAL) Adult Learner’s Week NAAL is the Norwegian coordinator of Adult Learners’ Week. Portugal In the city of Torres Vedras Andar na Rua The Portuguese project “Andar na Rua” encourages citizens to walk in the streets together as a way to empower them and to give them ownership of the city while learning about it. Scotland SwapWest Formula Mentoring The project seeks to address engagement with adult learners from our most socially and economically deprived communities and their progression to “go one step up” with their education, using mentors. Slovenia Slovenian Institute for Adult Education (SIAE) Lifelong Learning Week The Slovenian Institute for Adult Education work in close cooperation with about 30-35 regional and thematic coordinators, mainly adult education centers to organise the Lifelong Learning Week (LLW) in Slovenia every year since 1996. The Netherlands Learn for Life Annual Learning Festival Learning festival. The ARALE survey analysed awareness raising activities targeting the policy-makers. Germany Technische Universität Dortmund – Sozialforschungsstelle HessenCampus Hessen Campus aims to create partnerships between political institutions, local authorities and schools to facilitate the organisation of adult education on a regional level. Germany LitCam Literacy conference LitCam organises conferences about literacy targeting experts, publishers and politicians in the framework of the Frankfurt Book Fair. Germany ZEB Stephansstift Research project’s results presented to politicians ZEB Stephansstift presented to policy-makers the results of a research project underlining the benefits of adult education institutions´ work. Denmark DFS/DAEA Establishing a “Danish Research and Development Centre for Adult Education” DFS/DAEA participated in meetings with the government to influence the creation of a research centre for adult education. Sweden Folkbildningsrådet/Swedish National Council of Adult Education Creation of the document “Folkbildningens Framsyn” with strong input on national policy A broad dialogue with people active in folk high schools and study associations was created to write a policy document that was the basis for a government bill. Sweden RIO/FOLAC Letters for change – influencing policy-makers by mails RIO/FOLAC sends regular newsletters to policy-makers focusing on adult education. The newsletters contain information about how adult education can contribute to current political, societal or educational issues. Sweden SAEA A bus tour for awareness raising SAEA organised a bus tour for policy-makers to show them the work of adult education organisations. The bus stops in three different places during one morning, presenting different types of Learning. The ARALE survey analysed awareness raising activities targeting specific target groups. Bulgaria Association Generations Fusion of the Energies – Solidarity between the Generations A one day event was organised for elderly people with discussions, information stands on product to help them have a better life and a painting exhibition. Bulgaria Association Educational World New Perspectives in the education of parents The project aims to raise parents’ awareness for the need to improve parental competences and to discuss best practices and deduce a comprehensive programme. Denmark DFS/DAEA Webpage on basic skills for people with dyslexia A website for basic skills learning, with special emphasis on dyslectic persons, offered by non-formal adult education providers. Germany Bundesverband Alphabetisierung und Grundbildung The iCHANCE campaign The iCHANCE campaign is designed to motivate young adults to participate in basic education programmes. Companies and artists post a short video message encouraging them. Germany Zentrum für Allgemeine Wissenschaftliche Weiterbildung (ZAWiW) der Universität Ulm DASUN project The project DASUN built bridges between universities and NGOs in three Danube countries. Structures fostering adult education were created to offer classes for seniors. Germany Pro Arbeit – Kreis Offenbach – (AöR) Kommunales Jobcenter Workshop on literacy for placement officers A workshop for placement officers was organized at the job center. Its aim was to raise awareness for job seeker´s literacy and numeracy possible issues. Ireland National Adult Literacy Agency National TV Advertising Campaign In Ireland, the National Adult Literacy Agency (NALA) created a national TV Advertising Campaign together with the national postal services AnPost. The TV advertisement profile individuals who have addressed their literacy difficulty and aim to encourage others to take the first step and reap the rewards by contacting NALA. Romania Association for Roma community Development Sumnal Education for Roma adults The Project provides capacity building for adult education and develops programmes for adult education, literacy and completion of primary education for marginalised people through daily activities. Scotland Education Scotland The Big + The Big Plus is Scotland’s national adult literacy and numeracy campaign since 2004. UK Age UK ITea and Biscuits week ITea and Biscuits week is Age UK´s annual digital inclusion campaign to introduce older people to the benefits of digital technologies and the Internet. UK Historic Royal Palaces Palace Explorers The project aims to bring parents and children from a disadvantaged sector of the community together around workshops so that they learn together. Workshops as story telling are organised.